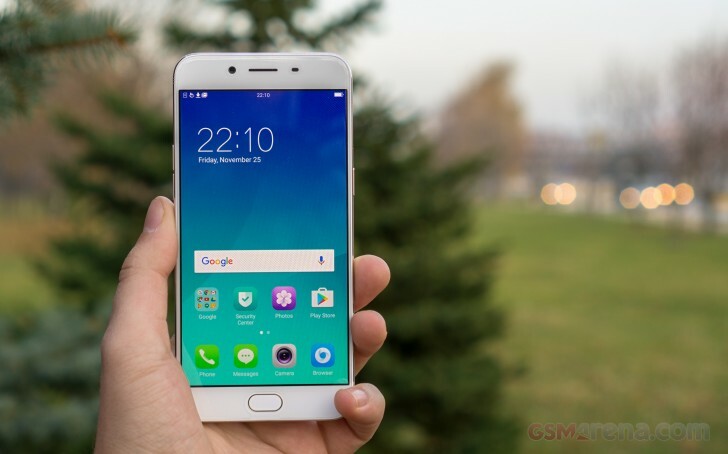 The Oppo R9s is powered by a Snapdragon 625 chipset. If your eyes blur when you see chipset model numbers, here's what that means - the R9s has eight low-power cores, there are no high-performance cores. This affects different apps differently. Even if an app can spread its workload among multiple cores, the performance of the Oppo R9s is not that good. It matches the Huawei nova plus (which uses the same chipset) but doesn't make much of an impression on the likes of Xiaomi Redmi Note 4 (Helio X20) or even the ZTE Axon 7 (Snapdragon 820, usually $400 but was $350 for a short while). On the upside, all those cores are built on a 16nm fabrication process, which means they are really power efficient. So the Snapdragon 625 slogan should really be - okay performance, terrific battery life. Well, we already saw the battery life numbers, and they are great. Now, let's see about performance. If the app needs one fast core, it's out of luck - each of the eight Cortex-A53 cores is close to half the speed of a high power core (either A72 or Kryo). So apps that fail to utilize the multi-core architecture of the Snapdragon 625 won't have that much to work with on the Oppo R9s. AnTuTu 6 shows general performance is better than some 5.5" phones that use old Snapdragon 61x chipsets (looking at you, Moto G4), but even an upper mid-range chip like the Helio X20 has the lead. Basemark OS 2.0 confirms these findings - the R9s scores place it between the likes of Moto G4, which have an old chipset, and the Redmi Notes that have an upper mid-rangy chipset. The graphics part of the Snapdragon 625 chipset is conservative too, much like the processor. It's an Adreno 506, which has about a third of the processing power of the flagship Adreno 530 (assuming the same clock speed). Compared to the Adreno 510 found in the Snapdragon 65x chipset (used in the Redmi Note 3), we're looking at a 25% drop in performance. The true results vary significantly by the type of graphics used. The older (and more common) OpenGL 3.0 is quite fine, there the Oppo R9s has 2/3 of the processing power of an Axon 7. Accounting for the difference in resolution - 1080p for the Oppo, QHD for the Axon - the difference melts away. However, high-end 3D games - the ones that make a point of using the latest available tech - hugely benefit from a flagship GPU. The Adreno 506 suddenly drops to a fifth of the performance of its big Adreno 530 sibling. Against the Redmi Note 3 and Note 4, the Oppo R9s is 30% slower (more than expected). Basemark X set to both High and Medium quality graphics shows a clear grouping of the GPUs - weak (Moto G4 and Galaxy J7), high-end (Axon 7) and everything in between falls in the "mid-range." You can see that even on this level there are two clear groups - and the Oppo is part of the less impressive ones. Here's one key quality of the Snapdragon 625 inside the Oppo R9s that we haven't covered yet - it's built on a 14nm process like the Snapdragon 820. That helps it run cool (even with the most demanding benchmark, the R9s barely warmed up) and helps it provide an amazing power efficiency. The Redmi Note 3, Moto G4 Plus and Galaxy J7 (2016) use 28nm chips, and those aren't nearly as efficient. One key takeaway, however, is that the chipset is one particular area where the Oppo R9s could have utilized a higher-grade part. Sure, the current chipset has enough power for daily tasks and casual gaming on its 1080p screen and it helps provide great battery life. But if you're interested in high-end gaming (AAA titles or VR), there are other options to look at with a similar price tag.